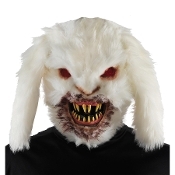 Scare the daylights out of everyone with this gruesome adult size RABID BUNNY KILLER RABBIT mask. This terrifying full face mask is made from vacuum-formed plastic, covered in white fur and features easy to see through red mesh-fabric eyes, long yellow pointy teeth and mouth covered in the blood of his previous victim! Mask is held in place by an elastic strap that goes around the back of the head. WARNING: Kids will never look at the Easter bunny the same again! This scary ZOMBIE BUNNY mask also makes a great Halloween prop just hanging on the wall or door - add a glow stick behind the eyes for extra creepiness. Halloween prop building supplies... add to a haunted house dummy, guaranteed to scare!